More recipes inspired by "Dishes Men Like". It is made by Lea & Perrin's Worcestershire Sauce and every single recipe contains their sauce! 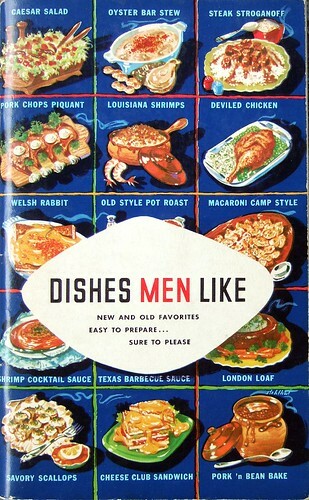 Clearly, men love these dishes. This is the rest of the dinner I made which composed of the previous blog entry (shrimp canapes and crab bisque), Caesar salad, and Chick'n Divan. Combine the garlic, Worcestershire sauce, olive oil, lemon juice, vinegar, mustard, salt and pepper, and Parmesan in a medium bowl. Once mixed, add the mayonnaise until smooth. Set aside. In a bowl, mixed together the lettuce, endive and tomatoes. Place the lettuce mixture in a serving bowl, top with croutons, then add the dressing. Sprinkle with more vegan Parmesan! * Note: I used Galaxy brand vegan Parmesan cheese topping. For vegan mayonnaise, I used Vegenaise. Cook asparagus in boiling salt water until tender, then drain. Place the asparagus in a large baking dish. Combine soup, nutmeg, Worcestershire sauce, and pour 1/2 mixture over asparagus. Top the asparagus with 1/3 cup Parmesan cheese. Defrost the vegan chicken and slice into 1/2 in. pieces. Top the asparagus with the chicken and pour remaining soup mixture on top. Sprinkle with another 1/3 cup of cheese. While baking, combine the whipped cream with mayonnaise. When chicken is done baking, spread the mayonnaise mixture over the chicken and sprinkle the remaining 1/3 cup cheese. Cook the rice according to box instructions. While still hot, add the remaining ingredients and mix well. * Note: The cream of mushroom soup I used was Imagine brand. The vegan chicken was Vegetarian Plus brand. For the soy whipping cream, Soyatoo was used. Vegan mayonnaise brand was Vegenaise. Earth Balance was the soy butter used. The recipes above were fantastic! I hope you all enjoy them. I'm looking forward to modifying and creating more vegan versions of these retro dishes in the future.